Deliveroo is a home delivery service for dishes. You will have access on your mobile to all the restaurants nearby that can deliver you. Whether you have a sudden craving for a burger, Japanese cuisine or another culinary specialty, you will inevitably find a restaurant that meets your expectations. 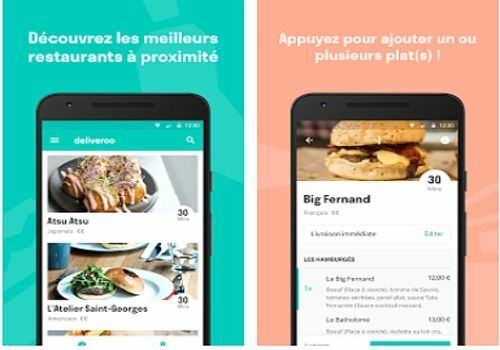 Deliveroo will only offer you quality restaurants (Le petit Cambodge, Santosha, Le Ruisseau, etc.) that can deliver you by bike in less than 30 minutes. Deliveroo is available in the largest cities in the world (Madrid, Milan, Sydney, Dubai, Hong Kong, etc.) and already offers 250 addresses for France. Foodchéri is a meals-on-wheels delivery service. All their dishes are prepared in their kitchens and delivered to your home! You can follow everything from their mobile application. Foodchéri iOS is a meal delivery service that aims to revolutionize the way you eat. Foodchéri cooks its own dishes and allows you to place your order directly from the application. Nestor is a service that offers a daily menu to replace your mediocre lunch break sandwich. This is a unique menu that you can have delivered in Paris and the inner suburbs. Nestor is a service that delivers meals daily in Paris and the inner suburbs. Every day, a new menu is concocted by chefs with fresh and seasonal ingredients. Find a selection of restaurants near you, and have them delivered in a few minutes.